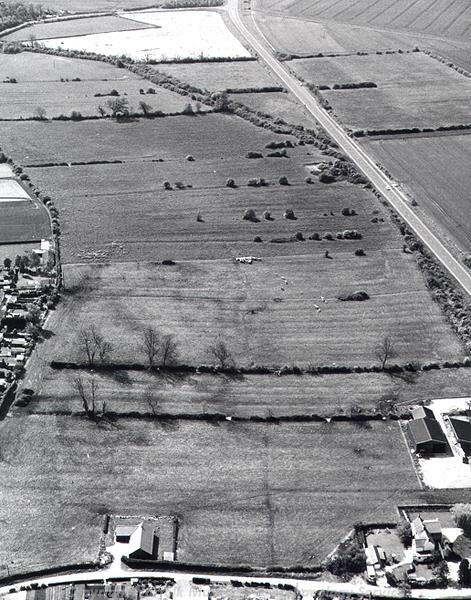 Earthworks of medieval ridge and furrow can be seen on aerial photographs. Earthwork survey of the site revealed this to be the largest surviving block of medieval ridge and furrow in Norfolk, totalling almost 19 hectares. Most of the strips are aligned east to west but a bank separates these from a north to south area in the extreme south of the site. An access trackway to the east of most of the east to west features has also been identified. 1987. Several fields, west side of island. E. Rose (NAU), 13 November 1987. 8 July 1988 and 23 February 1989. Earthworks of ridge and furrow visible on NAU air photographs. The area survey comprises the largest surviving block of medieval ridge and furrow in Norfolk, totalling almost 19 hectares. Most of the strips are aligned east to west, essentially downslope but a good headland bank separates these from a north to south area in the extreme south of the site where the strips are best preserved and most curving on the site. An access trackway exists to the east of much of the east to west features, in part coinciding with a former headland as some of the ridges convincingly join to it. B. Cushion (NLA), March 1996. Earthworks of extensive ridge and furrow still visible. --- Aerial Photograph: TL6197 C-E,F-K,T-V; TF6198 D-F; TL 6198 C; TL 6197 P-S.
--- Fieldwork: Fenland Survey. FENS. --- Aerial Photograph: Edwards, D.A. (NLA). 1998. TF 6197AA - AB, AJ - AW. --- Monograph: Cushion, B. and Davison, A.. 2003. Earthworks of Norfolk.. East Anglian Archaeology. Vol 104. p 201. --- Monograph: Silvester, R. J. 1991. The Fenland Project, Number 4: The Wissey Embayment and the Fen Causeway, Norfolk. East Anglian Archaeology. No 52. --- Article in serial: Gurney, D. and Penn, K. (eds). 1997. Excavations and Surveys in Norfolk 1996. Norfolk Archaeology. Vol XLII Pt IV pp 547-564. p 553. <S1> Unpublished document: Cushion, B. (NLA). Earthwork Survey.